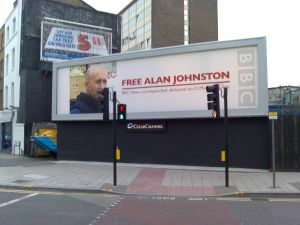 The BBC’s corrrespondent Alan Johnston was abducted in Gaza on 12 March and is still missing. The consensus amongst journalists is that he is being held by the Durmoush family in Zeitoun, a criminal gang who use kidnappings as a source of substantial revenue. This is supported by this admittedly dated article posted on IMRA and by this more recent piece on Ynet. This entry was posted on Monday, April 23rd, 2007 at 8:57 am and is filed under World current affairs. You can follow any responses to this entry through the RSS 2.0 feed. Responses are currently closed, but you can trackback from your own site.